by Peter Smith TRIBUTES have been played to Leeds man Keith Smith – who represented England at both rugby union and rugby league – following his death at the age of 53. Smith began his union career with Moortown and Roundhay and played for England and the Barbarians before crossing codes to join Wakefield Trinity, appearing at Wembley as a member of their beaten 1979 Challenge Cup final team. 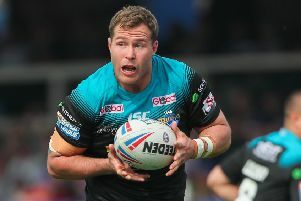 After retiring as a player he became involved with the East Leeds amateur club, coaching current Leeds Rhinos duo Richard Mathers and Danny McGuire at junior level. Mathers said he was "absolutely devastated" by Smith's death. "Keith and Richard Volante were my first coaches, from under-nines to about under-11s," he said. "I used to spend a lot of time with him. He took me under his wing, I owe him a lot. He was such a lovely, gentle guy." Smith's close friend Geoff Williams said: "He was a prolific sportsman. He swam for Yorkshire, but rugby was his forte. "He was a gentle giant and today's game of rugby league would have been made for him, he had so much class and skill." Dewsbury Rams coach Andy Kelly played alongside Smith at Wakefield. "He was one of the nicest blokes ever," said Kelly. "He didn't speak ill of anybody and he had a great sense of humour. "It is very sad. He was a good player. "I think because of his nice nature the aggressive side of the game was sometimes off-putting to him, but skills absolutely flooded from him." East Leeds chairman Peter Longbottom described Smith's death as a "catastrophic" loss. He said: "Everybody is very upset. "I knew him personally, away from rugby, and he was a lovely man. "He was a big part of making East Leeds what it is today, a Clubmark club producing the likes of Danny McGuire and Richie Mathers with more coming through." Smith, who had been suffering from cancer, died in St Gemma's Hospice, Leeds, last Friday. His funeral will take place at Lawnswood Crematorium on Friday, at 9.40am.